Immerse yourself in the rich architectural array of Lecce during a private 3-hour rickshaw tour of the charming city. 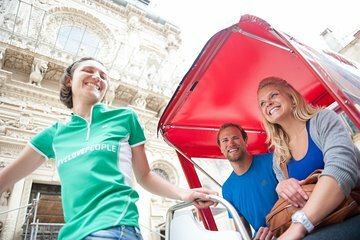 After selecting a departure time to suit your schedule, greet your guide and climb aboard your comfortable rickshaw. Cruise past historical highlights like the Roman amphitheater; absorb the Baroque beauty of monuments like the Basilica di Santa Croce; and delve into authentic local culture as you stop to sample local specialties in popular eateries. Receive the undivided attention of your guide on this tour. Geet your guide at your centrally located Lecce hotel and climb aboard your comfortable rickshaw. Listen to a short safety briefing and then embark on a comprehensive sightseeing tour of the city. Absorb the Baroque beauty of Lecce’s incredible architecture as you cruise the charming streets; listen to illuminating commentary from your guide and discover the rich historical heritage of Lecce. Sail past the ancient Roman amphitheater in Piazza San’Oronzo; marvel at the ornamental opulence of Basilica di Santa Croce; and soak up the lively atmosphere of Piazza del Duomo, home to prominent landmarks like Palazza Vescovile and Lecce Cathedral. Weave your way down ambient side streets to gain fascinating insight into local culture. See locals go about their daily business and your guide shares intimate knowledge of cultural traditions. Browse shops selling artisan gifts; sample local specialties in popular restaurants; and stop for a smooth glass of Italian wine. Please note, all food and beverages are at your own expense. After three hours of exploration, bid your guide farewell back at your Lecce hotel. Both guides very knowledgeable and caring. They looked after us during the terrible storm which fortunately was at the end of our your.